Image: Kopano Tlap/GCIS/FILE PHOTO Former President Jacob Zuma. The publication has established that Zuma’s lawyers have written to the commission‚ saying that he does not believe he has criminally or ethically been implicated by the testimony of former deputy finance minister Mcebisi Jonas‚ former ANC MP Vytjie Mentor‚ former government communications head Themba Maseko or his deputy Phumla Williams. Advocate Mike Hellens SC‚ who leads Ajay Gupta’s legal team‚ told Zondo that the Gupta patriarch had provided affidavits “setting out his version of events” in regard to the evidence given by Maseko and Mentor. Hellens has represented Jonas and therefore will not represent the Guptas in their bid to cross-examine him. Instead‚ Advocate Dawie Joubert will argue for Gupta brothers Ajay and Rajesh‚ and Duduzane Zuma‚ to be given the right to cross-examine Jonas. While Duduzane Zuma has indicated that he is prepared to take the stand‚ Ajay Gupta’s attorney Rudi Krause says he wants to give his evidence “outside of South Africa” because of his “mistrust” of local law enforcement officials. Hellens has already made it clear that the Guptas’ legal team will strongly argue that the right to cross-examine should not be linked to appearing at the commission “in South Africa” to testify. 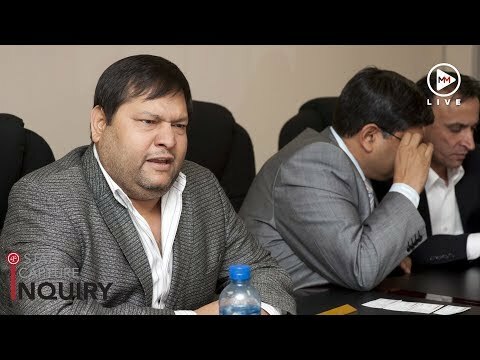 Gupta has been defined as a “fugitive from justice” by the Hawks‚ who say he will be arrested as soon as he sets foot back in South Africa. Zuma’s former PA Lakela Kaunda has also applied for the right to cross-examine Mentor about her evidence that she had arranged for Atul Gupta to ferry her from the airport to a meeting with Zuma. Mentor has testified that Ajay Gupta offered her the position of public enterprises minister at that meeting‚ in exchange for her killing the SAA route between Johannesburg and India. The hearing continues.